COMPASS went live on 1st April 2019 and is the new point of access for victims of domestic abuse across Southend, Essex and Thurrock; providing information, advice and guidance and, where appropriate assessment and access to specialist services. Its function is to increase accessibility to ensure victims of domestic abuse get the right support at the right time. COMPASS is funded by Essex County Council in partnership with our office to support victims of domestic abuse across Southend, Essex and Thurrock. COMPASS is accessible 24hrs a day. Callers can speak with a trained member of staff and there will also be an online form for both public and professionals wishing to make a referral via the website. COMPASS is delivered by Southend on Sea Domestic Abuse Projects. The telephone number is 0330 333 7 444. 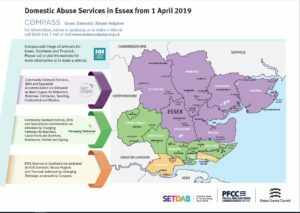 Click on the image to view a larger map detailing how Domestic Abuse Services in Essex will operate from April 1. Community services and specialist accommodation will be delivered by SOS Domestic Abuse Projects, Changing Pathways and Next Chapter. These community-based services are local hubs incorporating specialist accommodation such as refuges, IDVA (Independent Domestic Violence Advisors) and outreach work.